​Buying a new guitar is one of the most awesome and exciting experiences ever! Sometimes you put months of effort into researching, trying out guitars and saving up enough money to buy your new instrument. Other times you walk into a pawn shop and there is a hidden gem behind the counter at a bargain price that’s too good to pass up and you buy it on a whim. We all know a guitarists who only has one guitar and has never thought twice about getting a second. You probably also know someone that has 10 guitars and can’t play any of them particularly well. In this article we’re going to explore whether you actually need more than one guitar and why people chose to stick with ‘Old Faithful’ or go through guitars like they’re speed dating. Being a victim of GAS (gear acquisition syndrome) myself, I’ve owned my fair share of guitars over the years. My impulses for buying were often varied. First I had to have a guitar that would make me look cool, then I needed one that sounded better, then I needed one for to play jazz and funk because my other one was set up for rock & metal, then I needed another one because it was a special addition and I needed the gratification of being one of 30 people in the world to own it. The reasons are varied, but they often offer a look into what was going on in my head at the time. 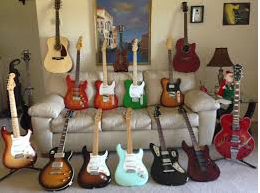 The Guy With 10 Guitars Who Can’t Play to Save Himself! A lot of my impulses were actually due to the fact that I wasn’t a great guitarists (at the time) and by somehow buying a new guitar would unlock the secret and make me a good player. This is often the reasoning behind the guy who has 10 guitars and no talent whatsoever. 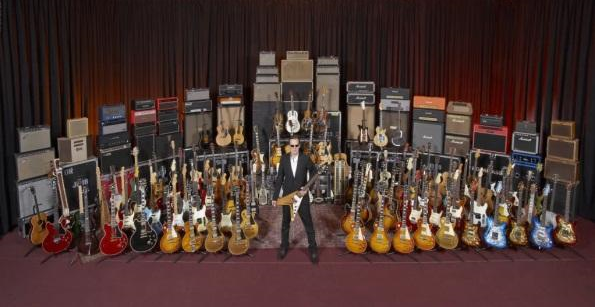 Does this guy need 10 different guitars? No! He needs to stop looking at guitar catalogues and youtube reviews and put all that time into practicing so that he can get good at one guitar. I do believe that having good gear is crucial and definitely facilitates better tone and technique but you need to have chops in the first place. On the other end of the spectrum is the guitarists who only has one guitar. Chances are this person has racked up a lot of mileage on their fretboard and can play a lot better than someone who's hobby is spending money. 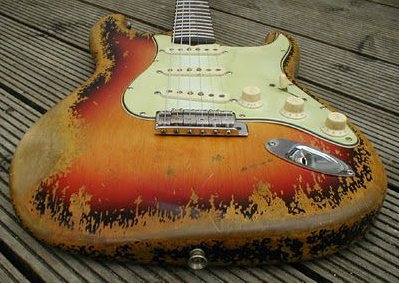 Their guitar often looks like a relic from a past age and has vintage gear lovers froffin’ over its worn look. While often being great players these people could often benefit from a gear upgrade, especially if they’re motives for keeping one guitar are financially driven. This is the philosophy that I subscribe to, having different guitars with different purposes. It can be as simple as having an acoustic guitar for acoustic guitar music and having an electric guitar for electric guitar music but can be as diverse as having different guitars for different genres or bands that you play in. If you’ve ever seen Kirk Hammett (of Metallica) or Keith Urban live you’ll notice that they use specific guitars for specific songs. The reality is that you need to find balance and what works for you. You only have so many hours in a day to play guitar and if you own more than ten guitars chances are eight of them gather dust and don’t get played at all. Subsequently If you only own one guitar but it’s poor quality you might need to upgrade and get yourself a workhorse to use for live or studio performances. My advice is to treat guitars like different tools for different jobs. You only need as you’re going to use but hey, if you have deep pockets and you just like collecting guitars, go for your life. Michael is a progressive rock guitarists and highly sought after guitar teacher from Melbourne, Australia. 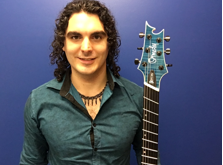 He has been guilty of owning more guitars than he has time to play and goes through a deep inner struggle each time he has the opportunity to buy a new instrument. If you’re serious about guitar taking guitar lessons in Melbourne will be the best investment in your money ever.